The former brownfield is a land assembly of 3 properties at the intersection of Greenwich Street and Mohawk Street. The properties were once the home of a number of farm industry manufacturers including Massey Ferguson, Massey Harris, Verity Plow, Cockshutt Plow, and Adams Wagon Factories. When the industries closed down, the property was abandoned. 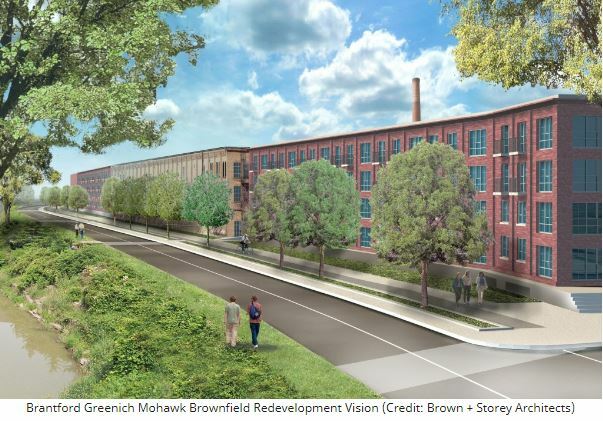 As part of the City’s brownfield initiative, the remediation and redevelopment of the Greenwich-Mohawk brownfield site was identified as a priority for municipal investment to initiate private sector interest. In 2002, the City commissioned the “Greenwich-Mohawk Streets Brownfields Sites Remediation Study”, which examined the opportunities and constraints of the property in its existing state. The study was approved by Council in 2004 and has since guided the City in all of its actions carried out on the site. The major contaminants on the sites were related to historic uses of the lands. The contaminants included petroleum hydrocarbons, heavy metals and polyaromatic hydrocarbons (PAH’s). Vinyl chloride was also found at one of the properties. Throughout the property acquisition process, the City worked to remove barriers to development on the site. This included eliminating the existing liens and tax arrears on the property, demolishing unsafe buildings, as well as removing debris, combustible materials, and underground storage tanks. Additionally, the City carried out further environmental and structural investigations in a number of areas throughout the site. The major clean-up project began in the Spring of 2015 following a Remedial Options Feasibility Study report in 2014. In total, 148,900 cubic metres of contaminated soil was excavated. Of this 35,740 cubic metres (24%) was above the original remediation estimates. In terms of sustainability: 73% of the contaminated soil was treated on site and reused, and only 27% of soil was disposed offsite. Biopiles were used to treat contaminated soil that was subsequently re-used. It was chosen over other alternative treatment methods as it was found to be the lowest cost alternative and it provided for onsite treatment rather than offsite disposal. The clean-up also involved the skimming of 120,000 litres of oil from the groundwater. The remaining contaminants in the groundwater were treated using air sparging and soil vapour extraction. To prevent re-contamination of the property from the adjacent rail spur line, barriers were built on city property adjacent to the privately owned rail corridor. An underground liner was placed on the property boundary with the rail line to reinforce an existing trench built in 2001 to collect and filter groundwater that flows south from the site. Also, a Waterloo Barrier® was installed at the northern boundary of the property in an area where a wooden tank containing heavy-end petroleum hydrocarbons was discovered during the cleanup. Although the tank was removed, there was still a large quantity of odorous soil on the site which couldn’t be removed without releasing odorous vapours throughout the neighbourhood. The barrier is about five to six metres deep and resembles a triangular box will keep the remaining contaminated soil in place. The $40.8 million for clean-up came from several sources. The Ontario government contributed $5 million to the project. The federal government also provided $12 million. The city also received a $23-million loan from the Federation of Canadian Municipalities Green Municipal Fund and a $512,520 grant from the same fund for the project. The city, meanwhile, contributed just over $1.87 million to the effort. A City of Brantford staff report prepared for councillors says the total budget for the cleanup effort was just over $42.8 million. Of that, just over $40.78 million has been spent. Planning staff are now working on a “preferred approach” to redevelop the site as part of the Mohawk Lake district revitalization strategy. The strategy includes the proposed revitalization of Mohawk Lake, the canal, as well as extension of Veterans Memorial Parkway and the Canadian Industrial Heritage Centre’s efforts to revitalize the time keepers building at one of the three properties as a museum.